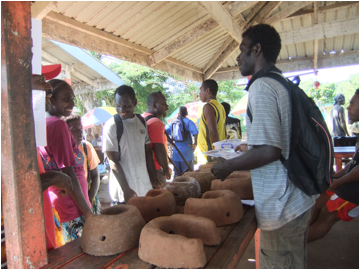 On Monday 21st March 2011, Kastom Gaden Association and Vanga , do a promotion of the importance of Kiko stove at the Gizo market and at the same time we put the kiko stove for sale. There more than 100 people at the market including students coming around to see the Kiko stove promotion . 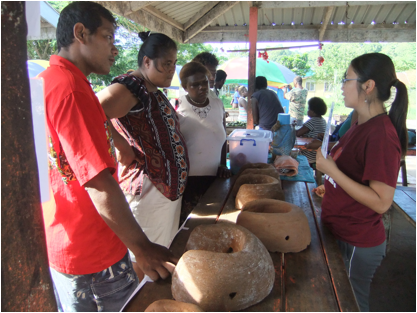 At first people come and Yukiko and Rove from Vanga come explain to the people the importance of the kiko stove. During the promotion we also demonstrate how to use the kiko stove using 4 pieces of firewood to see how effective and efficient this stove this. So we boil 4 kettles of hot water using 3 pieces of fire. After the demonstration woman and man coming to buy the stove and in no time all the 13 stoves are gone, they were sold at $30, $25, and $20. Kiko stove saves time, reduce smoke and help you to cook your food faster without using a lot of firewood.